Oprah Winfrey continues to inspire the next generation. If there’s a general rule of thumb regarding Oprah Winfrey, it’s that when she talks, you listen. Maybe so, but that doesn’t mean that the revered former host of the highest-rated day-time talk show in history still can’t dish out her trademark wisdom when it comes to the seismic shifts within Hollywood and around the globe. Sitting in front of Oprah is a bit of a surreal experience, but something about this woman has the overpowering, unique gift of putting those around her completely at ease. It’s exactly why she conquered daytime television, reigning supreme for decades. 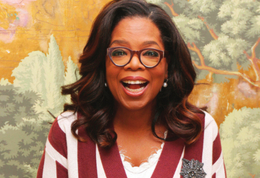 The 64-year-old Winfrey remains energetic and enthusiastic. She wildly gesticulates, hops off her chair, grimaces and grins. Over the years, folks in the Greater Philadelphia Area have had chance encounters with the mega star down the Jersey Shore, as Winfrey is known to have spent time in Stone Harbor shacked up at The Reeds hotel and even strolling the Boardwalk in Wildwood. Not to mention that her longtime partner Stedman Graham hails from Whitesboro. Just a few months ago, Oprah appeared with Graham at the Whitesboro Reunion Festival in Middle Township. While there she addressed the assembled crowd and posed for plenty of pictures and signed autographs. It wasn’t Oprah’s first trip to the festival; she also appeared in 2008 and 2013 and has donated $1 million to the Concerned Citizens of Whitesboro scholarship fund. Most recently, Winfrey was in the public eye as a star in Disney’s A Wrinkle in Time. In the film she plays the role of Mrs. Which and stars alongside Mindy Kaling and Reese Witherspoon as celestial beings from another dimension who guide young heroine Meg, played by Storm Reid, on her quest to rescue her father portrayed by Chris Pine. Like many celebrities, Winfrey shares a passion for philanthropy and giving back to numerous causes. She is the founder of The Oprah Winfrey Leadership Academy for Girls in South Africa, helping young girls from impoverished areas succeed academically. Additionally, she is the largest donor to the Smithsonian’s National Museum of African American History and Culture, having given more than $21 million. She has received various humanitarian awards and was given the Presidential Medal of Freedom in 2013, the highest honor for a civilian in the United States. Arrestingly charming and wise, Winfrey shares her experiences working on A Wrinkle in Time, how she deals with fame and talks about those who mentored her and instilled her desire to inspire others. And while so many look up to her, she’s still in awe whenever she meets one of her heroes. So how did you get cast as Mrs. Which? I wasn’t even supposed to be in this movie. ... I’m friends with [director] Ava [DuVernay] since I worked on Selma with her, she’s a wonderful close friend of mine. I was planning on tagging along with her while she shot in New Zealand—which is the most gorgeous country. I visited last year for a talk I was doing and the energy is incredible, if you don’t feel it when you’re there you’re not alive. And it all happened from there, I got a job, and a free vacation [laughs]. And the chance to touch hearts and be part of a story, a visual story that casts a light on the world, was the greatest gift tome. To help paint that power in the light. Because light is truly more powerful than darkness and always will be. And just a small amount of light can overcome any darkness. So there was that [laughs]. And the free trip to New Zealand [laughs]. The movie has an empowering message, especially for young girls. A movie centered around a 14-year-old brown girl, do you know how much I would have cherished that when I was a14-year-old brown girl? Because there was no one who looked like me doing anything like this. I was just looking for white girls with dark hair, I was happy with that [laughs]. Or a white girl with a round nose, I was happy if I got that. But today, young brown girls and white boys will have someone to look up to in Storm and [co-star] Levi [Miller], where they can dream, and hope and aspire, where the power play is switched around and the brown girl is the leader. It’s inspiring for me to be involved on the periphery and support a project like this where so many young kids will see the reflection of themselves up on that screen and what impact that will have and in the future. And 14 is a tough time for kids. There’s so much self-doubt at that age, there’s insecurity and a lot of susceptibility to outside influences, be it bullying or magazines, and through all that noise, you have to find a way to hear your own voice and learn to trust that voice and understand you are who you are meant to be, you are not meant to be anyone else. This is your plan. When Mrs. Which says to Meg, “You have to find your own frequency,” what a remarkable lesson for all of us, especially today with social media, there are so many other frequencies happening around us. You have to find your own and have faith and loyalty in that. That will serve you better than anything in your life and anything becomes possible. How would this movie have affected and guided you at 14? Well, 14 was a very difficult time for me, it was rough. And to have guidance at that age, my life might have been very different. But I do believe, the lowest moments in your life, the deepest pits where you don’t understand it then, when you’ve been around now for as long as I have, you know every single moment of emotional destitution, where you couldn’t see a way out. Every single moment is a building block and another step in your journey to being who you are meant to be and who you are meant to become. One of my favorite quotes from the movie was when Mindy [Mrs. Who] says, “A wound is when the light enters you.” We see our struggles so often as experiences that make us weaker but it’s the opposite, they make us stronger. Who were some of your mentors? I had a couple, some accidental. An editor when I was working in the [TV] newsroom in Baltimore, and every night, he used to yell, “Winfrey, where’s my copy?” And I was petrified of him. I used to go to work every day shaking with fear because I wasn’t a great writer, I wasn’t fast enough. So I didn’t get fired in the end, but I did get demoted to the talk show, which was seen as a big demotion in those days. And that’s where it all began. So I thank him. And the other I will say is my great mentor, my treasured mentor and mother, Maya Angelou. I became her daughter, she became my spiritual beacon. And I actually modeled much of Mrs. Which on Maya, that’s where my inspiration came from. Maya Angelou and Glinda the Good Witch from The Wizard of Oz [laughs]. A Wrinkle in Time is kind of like The Wizard of Oz for a new generation. You’re one of the most famous people on the planet, and you’ve got first-name fame, which is the biggest of them all. Did you give any advice to young Storm, given she’s at the beginning of it? Fame is an interesting state of mind. Because you yourself, you don’t change, it’s everyone around you who changes. You stay the same. And she will stay the same, she won’t change. It’s who you are within before the fame; that becomes magnified. And she is a lovely young kid with a gorgeous heart. That won’t change. During your time hosting the show, or even now, have you ever found yourself star struck? I don’t think I’ve ever really gotten star struck or get star struck because I tend to live like we are all the same, because we are. Nobody is more or less than the next person, which is akin to Mrs. Which’s ideology. But I also can’t get away from the fact that we have heroes and lights we look up to and for me, I had a few moments [that] come to mind. Nelson Mandela was a very defining moment for what he represents for freedom and equality. Sidney Poitier, because I had watched him my whole childhood and his winning the Oscar in 1964 was earth-shattering for me and little brown kids everywhere. And I always remember Diana Ross. That was an overwhelming moment, a lot of tears, a lot of hyperventilating, because I had dreamed of being a Supreme [laughs]. 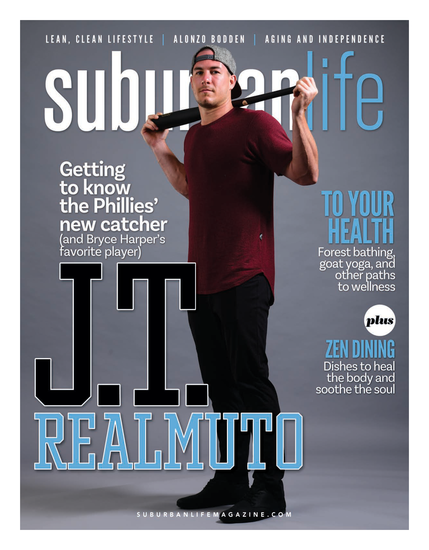 Published (and copyrighted) in Suburban Life Magazine, November 2018.